Are you an outgoing and vibrant personality with excellent communication skills and polite manner? Would you help small business in your local area succeed online? 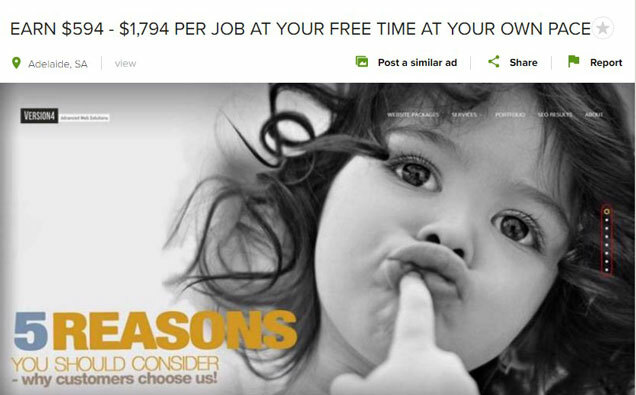 Would you choose the opportunity to earn serious money? This part-time job, commission-based sales role is ideal for someone who portrays a professional image, is customer-focused to provide excellent and quality customer service, is not afraid of a challenge, can work independently from home to schedule meetings with clients - autonomously without needing micro management. Candidates will be required to demonstrate cross-selling skills and must possess advanced knowledge of the web industry including online marketing and business development methods. You must have an ABN, or will obtain one before getting commissions.